Begin by "parboiling" your zucchini. This is a fancy term for partially boiling food. Here's the quick process: bring water to boil and insert the zucchini for 6-8 minutes. Move the squash from boiling water to an ice bath. "Ice bath" is a fancy term for ice water. Putting the zucchini in the bath stops the cooking process. After the squash is cooled, drain in a colander. Meanwhile, stir together the egg, mozzarella, and half & half and set aside. 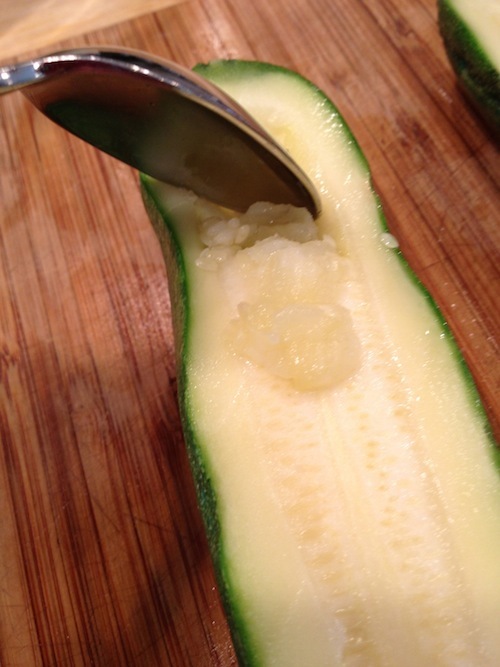 Take the now cooled zucchini, cut in half and gently scoop out the seeds/pulp in the middle. Place the hollowed zucchini on a foil lined baking sheet.Take the pulp and chop finely (if it's not already soft) and press the water out through a sieve. Add the pulp to the egg and cheese mixture. Stir together. Fill the zucchini with the mixture.In another bowl, Stir together the panko, Parmesan cheese, and paprika. Sprinkle the panko mixture over the zucchini and bake at 350 degrees for 12-14 minutes. Serve with your favorite entree!